A few days after Hannah and I managed to get all of her belongings locked in the elevator (then freed) during her move, she decided to paint her new bedroom. Well, one of the walls. We went to a nearby paint shop to see what colors were available. She was thinking maybe yellow at first, but when we left the paint shop and walked down the street, Hannah was inspired by a gorgeous green door. She slept on it, and the next day green it was. 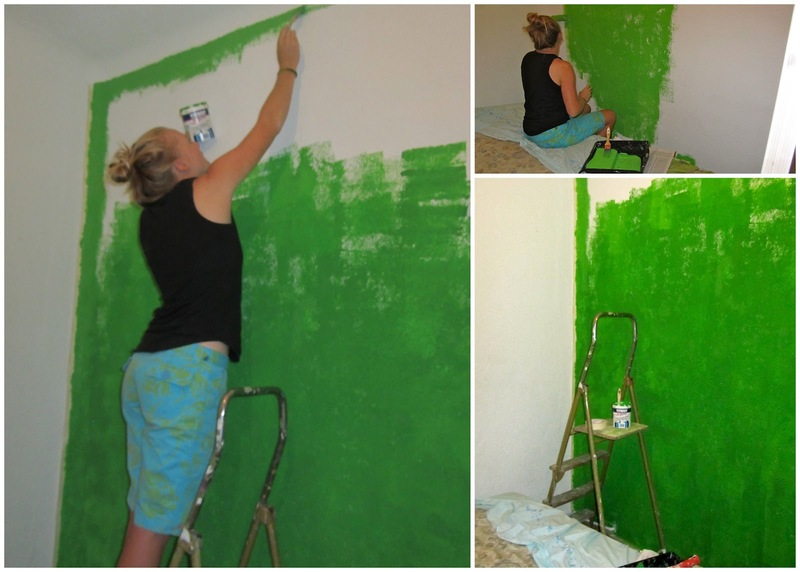 She bought green paint for the wall, plus some blue to paint her red shelves and desk (and some blue waves on the wall). Notice the red desk holding our painting supplies. It won't be red for long. We then picked up some tinto de verano and snacks, then turned on the music. Ready to paint!